Gasket & Packing specifications. Military Specification and Special Application Sheet Stocks and Gaskets also available. Contact Us for additional information and quotes. Natural Rubber Natural Isoprene 3200/800 -65 to +212 Good physical properties, good resistance to abrasion. Fair resistance to weather and ozone exposure. Excellent non-oil resistance to rubber compound designed to resist flow under compression. Standard for gasket cutting in plumbing trade and general purpose use against water, air and low pressure steam. 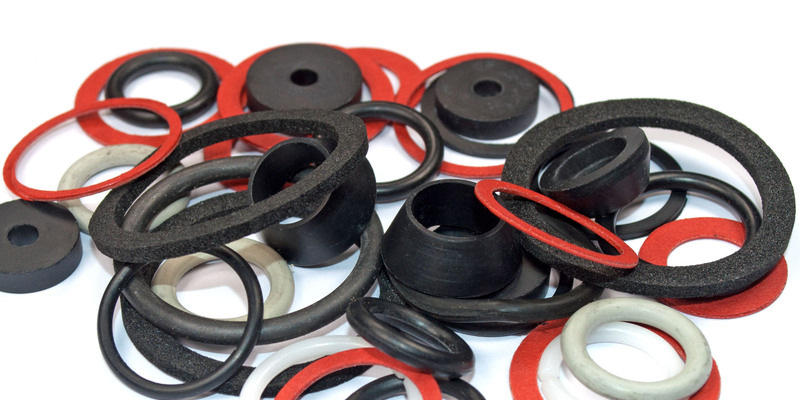 Black & Red Rubber SBR Styrene Butadiene 700/300 -65 to +250 Excellent physical properties including abrasion, tear strength and soft rubber seal where applied pressures are light. Resists most inorganic salts, ammonia, acids, and alkalis. Non-toxic and non-marking. C.I Rubber SBR Styrene Butadiene 700/300 -65 to +250 Same as above except cloth inserted to prevent creep in flanges. Butyl SBR Butylene Isoprene 1500/500 -40 to +300 Good weathering resistance. Excellent dialectic properties. Low permeability to air. Resists effects of many acids, alkalis and ozone at moderately high temperatures. EPDM Ethylene Propylene 1650/450 -90 to +035 Hydrocarbon rubber having excellent resistance to heat aging, oxidation, ozone, acids, alkalis, hydraulic fluid and electrical sensitivity. Buna-N Nitrile Butadiene 1000/400 -40 to +200 Commercial grade general purpose sheet for extreme exposure to oil, arpmatic and hydrocarbon solvents. Neoprene Poly-chloroprene 100/400 -40 to +200 Commercial grade general purpose sheet with good oil and weather resistance properties. Excellent for mounting pads, diluted acids and alkaline applications. Hypalon Chloro-Sulfinated Polyethylene 2400/400 -40 to +300 Excellent acid resistance such as sulfuric acid and hypo chlorite solutions, outstanding weather, oil, abrasion, flame and heat resistance. Urethane Polyurethane 4000 -40 to +250 Highest available abrasion resistance, strength amd load bearing capacity. Excellent oil and solvent resistance. Silicone Dimethyl-polysiloxame -165 to +500 Outstanding high and low temperature range. Odorless, tasteless, non-corrosive and non-contaminating. Viton Fluorinated Hydrocarbon 2250/300 -40 to +400 Unsurpassed for service in oils, fuels, solvents and many chemicals; such as carbon tetrachloride, tuluene, benzene and xylene.